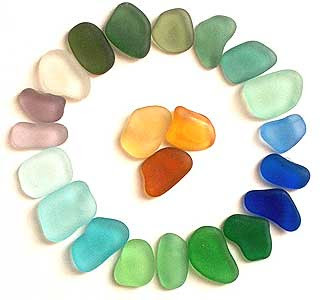 I love sea glass....I love wandering on the beach, looking intently for the sea's treasure, spotting little bits of colored glass and pocketing them as I go. 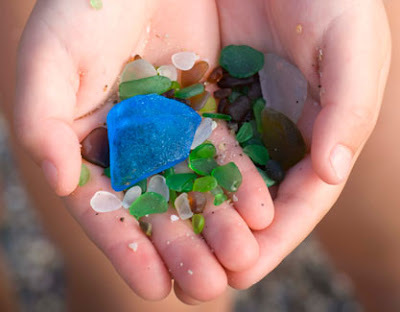 Last Sunday I opened up the morning paper, savoring my cup of coffee and my 'alone' time before my boys and the dog wake up, and came across this article about sea glass in Parade Magazine. The writer, Stephen Fried, tells us that while there is less of it on beaches than ever before--because of recycling, sand replenishment, and rising water levels--interest in collecting "mermaid's tears" has only grown in intensity. To get to the best sites, extreme glassers will do whatever it takes--hike for hours, jet-ski long distances, even rappel down cliffs--to find the glass. 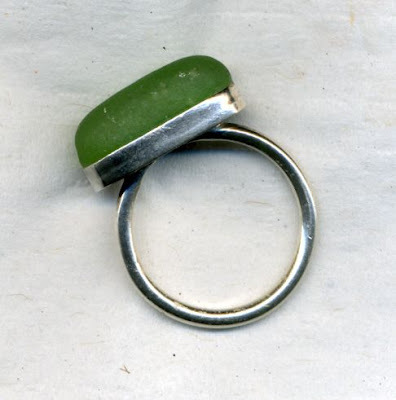 Individual pieces may sell for several hundred dollars, and jewelry made from seaglass can fetch even more. I love my sea glass ring that I purchased when I was in Pacific Grove a few months ago. * Greens and browns are common. * Blues are harder to find — but not impossible: Cobalt or cornflower blues crop up once in every 250–500 pieces. * Aqua and seafoam are rarer. * Most purples were originally clear; the manganese in them slowly oxidized into the rarer hue. * Glassing holy grails: true yellows, oranges, and the beloved — and ultra-scarce — red.